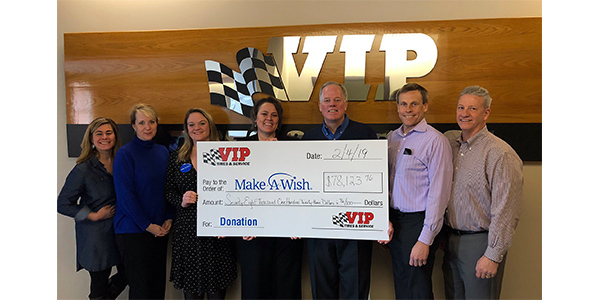 VIP Tires & Service, a provider of retail tire installation and professional automotive services in Northern New England, announced it is donating $78,123.76 to Make-A-Wish. The funds were raised during the company’s annual holiday Season of Wishes Campaign at its 58 store locations. Since 2007, VIP has raised more than $483,000 for Make-A-Wish through its annual fundraising effort. VIP encourages employees and customers to make individual donations and then matches the amount 100 percent. The company’s 58 VIP stores raised $39,061.88, and with the VIP match, $78,123.76 was presented to Make-A-Wish on Monday, Feb. 4 at the company’s headquarters in Auburn, Maine. Make-A-Wish grants wishes to critically ill children all across the country. 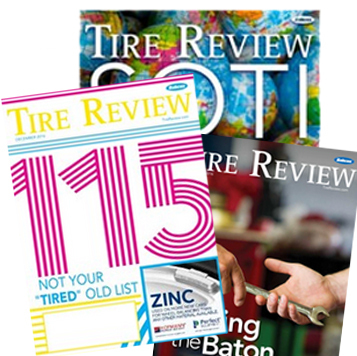 The average cash cost to grant a single wish in Maine is about $7,000, and the funds that support the wish-granting effort in each state are raised through campaigns like the one VIP Tires & Service holds each holiday season. Wishes range from trips to theme parks, meeting a favorite athlete or celebrity, attending a major sporting event or concert, receiving a computer, tree house, or shopping spree.